This page has been updated with information about the new smart card which is replacing the old ID card. This is done according to age. However, if you want to get it sooner, you will need to go to the Conversion Centre at Ebene as they accept people of all ages there. You'll be issued the first card free of charge but if you lose it, you'll have to pay Rs350. The second time it gets lost, you'll need to pay Rs700 and for every other subsequent loss, the charges are Rs1000 for a replacement. They are open everyday except Thursdays from 10:30 to 18:30 in summer and from 10:00 to 18:00 in winter. Once you've registered for the new card, you will have to go back to the same conversion centre after 2 weeks to collect your new card. Proof of Address (electricity, water or telephone bill, rent book, bank statement) not older than 3 months. Divorced women should also bring a Court Order if they wish to keep their husband's surname. Mauritians living abroad can exchange their existing ID during their next visit to Mauritius as this process can only be done in person. For a debate about the advantages & disadvantages of this new card, please read this discussion. An identity card is a document that allows the personal identification of a person. Upon reaching the age of 18 in Mauritius, all citizens must apply for such a card under the National Identity Act (1985) within six months. The card is issued by the Civil Status Office and contains information about the bearer pertaining to the full name, date of birth, a specific identifier code (that is the code quoted on all documents demanding the ID card number and is unique to each person), a recent passport size photograph and the blood group if applicable. Port Mathurin (Rue Solidarite) in Rodrigues. Hours of business are from 9am to noon and 12.30pm to 3.30pm on weekdays and from 9am to noon on Saturdays, Sundays and public holidays. How to apply for the National Identity Card? Documents needed for the application of an ID card are the birth certificates, certificate of naturalisation for non citizens, marriage certificate for married women and a filled application form. The first issue is free of charge but in case of loss, a fee of Rs100 must be paid and a police certificate must be produced for the provision of another card; for senior citizens, the fee is Rs50. Over the past years, there has been the question of the implementation of a new technology called the smart card technology to be used as ID cards. These are just like credit cards with a micro processor that contains personal information about the bearer. They are very easy to read and can store a lot of information such as banking details, credit cards’ information, personal identification amongst others and the advantage is that information is difficult to erase. The government still has to develop applications and train personnel for the implementation of this new technology for better and effective modern government services. Any fingerprints or biometric information which have been collected will have to be destroyed, at least that's what the verdict was by the Supreme Court on 29 May 2015. I think the new card will still be used as it is a huge improvement from the old one and way nicer to look at too but rest assured, no one will need to give their fingerprints anymore. This has been extended to 31 March 2016. Hello Reshma,I am in the same situation as you I lost my identity card. Not sure whether we can apply for new one from here. I am in Kent. Need to find out more. Hello I am from Birmingham, born in Mauritius, I wish to apply for an Identity Card. take your birth certificate and go to port louis where nic are being processed. hi my birthday was on 19 august 2013 so do i need to apply for my identity card now itself or shall i wait for 1st oct to have the new identity card?? Just take your birth certificate and go to at p.louis and do it. no need to fill any forms everything is done there. Unless you really need it now, I'd say wait and get the biometric one once and for all. Do we need a new photo for the new ID card or will they use the old one? Hi, bout the recent passport size photograph, should I have it taken elsewhere(bring along my D.O.B certificate & proof of address) or the photos will be done at the ID Conversion Centre?? The photo is taken then and there (same as with the old card). So no need to worry about this. Thank you so much gices. I was born in Mauritius, but have been living in Australia for 46 years, and wish to apply for a Mauritian Identity card. Could this be applied for at the Mauritius Embassy in Australia, I still have my birth certificate. hello am from mauritius i got my 18 in april 2013 i have not yet register fo my id card .am about to in october itselt so will i get the new one or i will have to register for the old one fisrt....????????? Hi @gices, what about retired people?? Apparently elderly persons are already going and my mum wants it done once and for all. Thing is, she doesn't know what are the documents to bring? I would have call them but they are close on Thursdays. Any idea?? Thank you. P:S> She's a widow, should she bring my dad's birth & death certificates too?? For those over 55, registration is between 1 June 2014 and 31 July 2014. However the Conversion Unit at Ebene will accept people of all ages. i am going to remove my NIC in age of 19 is it a problem?IS it AN OFFENSE? Hi my name is Timish Ramrajh apparently I was born in south Africa.when my dad passed away my mom married a Mauritian he adopted me when I was eleven when I reached eighteen we imergrated to Mauritius and I applied for a Idcard in Mauritius but in the adoption papers it states that I shall bear the name of Timish emambaccus but the problem is that my left a will in my name (Timish Ramrajh) when I applied for Mauritian id I presented all my doc and my name is Timish Ramrajh in my old Mauritian id so when I went to apply for my new id they told me that I will have to change my name to Timish emambaccus .so if I change my name will I lose my south African identity and the wills as well. Hello. I haven't changed my ID card yet (26/11/14). Do I still need to do it? And, if so, do you know when I need to do it by? Also, is it even necessary? Can I not just use my passport wherever I need to? It's a British passport. You can use the British passport for some things but not everything. 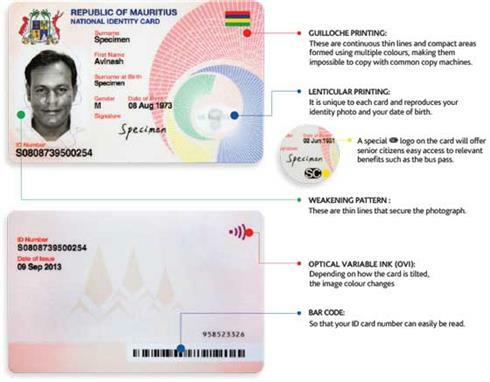 For local services that Mauritian citizens require, you'd need the National ID Card. For instance, if you were to register as self employed in Mauritius, you'd need that ID card to get your Tax Registration Number (TAN). This is just an example from the top of my head, there are many more situations where even a Mauritian passport will not suffice. Hi my name is prakash well my problem is my dad name was deepak everywhere he go they know him by deepak every information he has put deepak but when he got he new id name card his name change to deepak to deepat well i want to know what he must do to change his name back to deepak what process must do please help getting very problem with that thnx in advance..
Go to the National Identity Centre in Port-Louis (Emmanuel Anquetil building) with the birth certificate confirming the proper spelling of your dad's name and they should be able to sort it out for you. I am from Sydney and was in Mauritius in Oct15 and did by NIC. When I got back I try to put in my Tax return online... I realised that the number on my new id card is different from the old (plastified/paper)one. Anyone know of a website I could go on to rectify this? Hello. I actually have a major problem, if we can call it that way. I am a Mauritian recently married to a foreigner. I went to the ID Card Office in Port-Louis to do a new ID card to exchange my name to my husband's surname. I have already went there today and signed all the necessary documents. They took my fingerprints and even my new signature. My parents earlier actually suggested that we would use the old ID Card of mine to do the construction of my house. The thing is that, with my old id card we would be having benefits such as free roof because im still dependent on my parents. So basically i will be having some benefits if i decide to apply for those. Worse, i actually did my new ID card today and im gonna fetch the new ID that has my husband's name on it on the 13th January. If i want to renounce to do the new ID, do you guys think that this is possible? I mean, my husband is going back to his country on the 13th January, which is the date for me to get my new ID. He was suggesting that to cancel to do the new ID, we could say to them that :: we are trying to do procedures for me to go to his native country but then due to the lack of time (where we thought that we would be having the new ID before he leaves Mtius), we will cancel to do the new ID and will only do it when he comes back in Mtius in September 2016. So that we will have plenty of time to do my new ID and do the necessary procedures using the new ID. :: At the same time, this would get me plenty of time here to help my parents to get those benefits with my maiden name ID card until he comes back in Mtius. Excuse me for the English. I know this might sound desperate but i Need help as fast as possible, if its possible. I was born in Mauritius but now live in Canada since I was 9 yrs old. I would like to get my nationality card, never had one before. What documents other than my Birth Certificate do I need to provide? Marriage certificate? Plan to visit Mauritius in March 2016 and would like to be prepared in advance. thanks! I was born in the UK and have both UK and Mauritius passports (courtesy of my parents). However, I’ve never applied for a Mauritian ID card. How to obtain CERTIFIED copy of National Identity Card, Birth Certificate and Education Certificate? My ID card is damaged, what are the steps to get one new? Can I get a new Identity Card at Rose Hill?? Do we really need a new Identity Card with biometric technology and our fingerprints on?